Microsoft sold more than 2 million Xbox One consoles in just 18 days, its maker has revealed. As the console's first post-launch system update arrives, the Xbox One is sold out in most major retailers, Microsoft said in an Xbox Wire post. 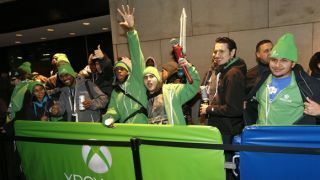 The Xbox One has so far averaged 111,111 units sold per day, which Microsoft said is a new record for Xbox consoles. At one point Amazon was reportedly receiving 1,000 Xbox One orders a minute. Xbox One users have spent more than 83 million hours in games, TV and apps in that time. Gamers have engaged in over a million paid game and video transactions on Xbox Live, said Xbox's Corporate VP of Strategy and Marketing Yusuf Mehdi. And they've unlocked 39 million Xbox One achievements, accruing 595 million total Gamerscore points. Walmart and GameStop execs also chimed in on this announcement to say that the new Xbox console is selling well as the holidays approach, and did so particularly on Black Friday. More units, the execs said, are something they're eargerly looking forward to. In comparison, Sony announced earlier this month that the PS4 had sold 2.1 million units since launch. While that seems comparable on the surface it's not exactly a fair equation; the two consoles' launches look extremely different, with the PS4 already out in 32 countries while the Xbox One is only available in 13 launch markets. Microsoft's Director of Programming for Xbox Live Larry "Major Nelson" Hryb has also detailed the Xbox One's first major system update since launch. Because of the Xbox One's "instant on" mode that puts the console into a low power state when it's turned off (allowing users to turn it on with voice commands), many units will automatically download the update. Once the update is downloaded Xbox One users will need to manually turn their consoles on without using voice commands, at which point the update will be installed. Xbox One owners with "instant on" turned off will be forced to install the update manually after December 12. The update is only the first of many planned for the coming months. "We've got quite a few updates planned for the next year based on the community feedback we've been seeing," Hryb said, "and I'll have details on those in the future." The Xbox One and PS4 are two boring black boxes with a lot of promise.